The iPad Kneeboard gives pilots greater flexibility to choose the digital kneeboard solution that's best suited for them. Designed to be used with all iPad versions. The iPad Kneeboard is a versatile case and kneeboard that helps pilots protect and use their iPad in flight and on the ground. The elastic strap secures the case to the pilot's leg for in flight use. 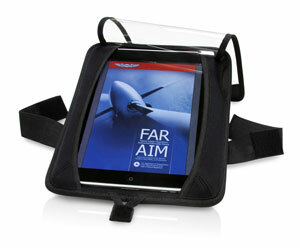 The unique plastic cover keeps the iPad screen safe while maintaining full viewing and complete touch screen functionality. The easel folds to position the iPad at a convenient ''wedged'' viewing angle; alternatively, it can lay flat. The pocket on the back offers room for papers and maps. Openings are provided for charger and headphone/earbuds.